Police have launched a manhunt for six big-time swindlers victimizing at least 20 local businessmen who ended up losing at least P2-million worth of consumer goods, including three vehicles, computers and various merchandise. 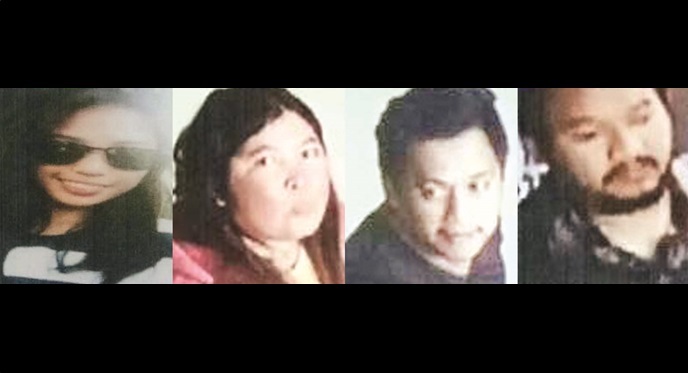 The identities of four of the swindlers have been tagged by police through footages of closed-circuit television (CCTV) cameras as the group fled from their innocent victims early Sunday dawn. The suspects are identified as Feliza Domingo Torralba, allegedly 29-years old and the syndicate’s ring leader; Merryanne Ramas Torralba, Ferrer Ramsi Torres, John Michael, Rosenda Co and Liah G. Domingo. A “wanted poster” with the photographs of four of the suspects is being circulated by the Philippine National Police (PNP). The group which operated here in the province in a span of one month is allegedly part of an organized syndicate operating from Mindanao. Meanwhile, police are preparing charges for large-scale swindling, syndicated estafa and other non-bailable offenses against the syndicate. Bohol Police Provincial Director PS/Supt. Felipe Natividad told the Chronicle that they are tracking down the group who are possibly hiding in Agusan del Norte or elsewhere in Mindanao. The group boarded a Lite Shipping “ro-ro” vessel at the Jagna Port at 10:00 a.m. Sunday on board four vehicles fully loaded with their stolen merchandise. The syndicate, led by Ms. Torralba, have left the province at dawn on Sunday on board four vehicles fully loaded with their stolen goods. The group travelled to Jagna town where they boarded a Lite Shipping ro-ro vessel going to Nasipit, Agusan del Norte. Some 19 businessmen who fell prey to the syndicate have surfaced to coordinate with the authorities but police say there may be others who are believed to have opted to remain silent to save themselves of the humiliation. The list of victims include two car dealers, a balikbayan, an agri-vet supplier, general merchandisers, a pharmacy, a tire dealer, a computer dealer, cellphone and accessories store, paint supplier, and several sales agents. An owner of a residential unit at the plush Royal Palms-1 in Dauis town was also among the victims as her fully furnished house was leased by the syndicate members. When the group hurriedly left with their loot, they also took with them valuable house appliances. 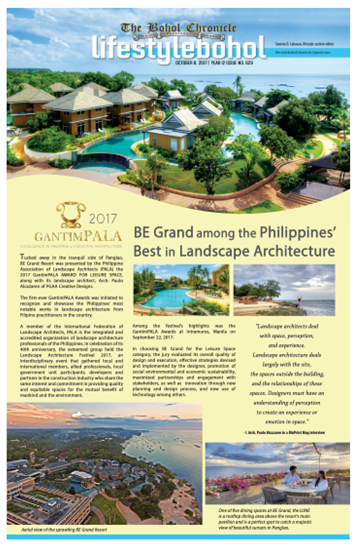 Police investigation revealed that the group came to Bohol sometime in the later part of September this year and leased a residential unit owned by one Analyn Antasuda, at Royal Palms 1 in Dauis town. Apparently, renting a residential unit at an upscale housing subdivision was part of the group’s cover to look the part of a well-off businessman. The gang leader, Felisa Domingo Torralba, then opened a bank account at Security Bank Tagbilaran Branch. Simultaneously, the group also opened a general merchandise store near the Manga Public Market in Tagbilaran City, named “F. Torralba General Merchandise” renting a space owned by the Saco family. Torralba was able to apply online for a DTI business name registration and the corresponding permits, BIR and BFAD accreditation to render a semblance of legitimacy to the business. With the assistance of her cohorts who acted as her store staff and merchandisers, Torralba’s business pretended to be a distributor of a wide range of products, from food items, food supplements, rice, agrivet supplies, and household items. As the business appeared to be legitimate, Torralba was able to convince local suppliers and dealers who eventually agreed to deliver their products in wholesale quantities. Even at the time that the group was purchasing smaller quantities, Torralba paid in checks to her suppliers. The checks which she initially issued were all encashed. Until sometime in the last week of October, as she now gained the trust and confidence of her suppliers, Torralba began a buying spree by purchasing all sorts of products in bulk and issuing post-dated checks as payment. The last batch of payments were issued Security Bank checks dated Oct. 31, 2017. Sensing that it was a big-time syndicate, the radio program sought the assistance of Cabinet Secretary Jun Evasco to relay the plate numbers of the vehicles to the Highway Patrol to intercept and impound them. However, until yesterday already six days after the suspects left for Mindanao, there was no update regarding the vehicles even as their plate numbers were also blasted to PNP stations in Mindanao. It was only on the morning of October 31 that the suppliers realized that they have been swindled when most of them turned up at the Security Bank to encash their post-dated checks. As one supplier after another got informed by the bank’s teller that their check is unfunded, news immediately broke out among the rest of the check holders. One of them is Dionisio Borja who was convinced into selling his newly-refurbished Kia Bongo cargo truck to Torralba on October 28. Since it was a Saturday, Borja agreed to accept a post-dated check issued by Torralba in the amount of P300,000.00 as full payment for the Bongo truck. Borja said he was led to believe that Torralba was a legitimate “general merchandiser” as she was able to show documents of her business and her store outlet near the Manga Public Market. Accordingly, on the first banking hours on Monday, Borja went to Security Bank to encash the check, but as he waited, he was later called by bank manager, and was consequently told that his check is unfunded. Borja rushed to Torralba’s store outlet in Manga but was surprised to see that the store had already been padlocked. He immediately alerted the Highway Patrol Group and the Land Transportation Office which was how they were able to track down Torralba’s exit point through Jagna Port. With the help of well-meaning citizens, police investigators were able to obtain CCTV footages which captured the faces of four of the suspects, namely, Felisa Torralba, Merryanne Ramas Torralba, Ferrer Ramsi Torres and John Michael. Police were able to associate the names of the four suspects with the CCTV footages through the identification card used by Torralba in transacting business with her victims and some documents which were left by the group at the house they rented at Royal Palms. According to PS/Supt. Natividad, charges can already be filed based on the identities obtained so that the police can ask the courts to issue warrants for the arrest of the suspects. “However, filing cases is not enough. We must be able to make arrests,” Natividad said. According to Natividad, the Bohol PNP is closely working with the Police Regional Office (PRO) in Region XIII where the syndicate is reportedly hiding. “We are closely coordinating with Regional Director CSupt. Rolando Felix, head of PRO-13 and we have forwarded to him our leads in the investigation. It is in Region 13 where the manhunt is focused because our investigators have reason to believe that the suspects are in the area with the information that they took a boat bound for Nasipit,” Natividad added. Police investigation reveal that Torralba’s group had been planning to make their big haul of various merchandise and then flee the province leaving their unsuspecting victims with unfunded checks. A check made by the Chronicle revealed that Torralba have left their leased residential unit at Royal Palms 1 at around 1:50 in the morning based on the time logs of the subdivision’s security guard. According to the security guards at Royal Palm, Torralba’s group left on a convoy of four vehicles, which included a blue Mitsubishi Adventure, 2 white Kia Bongo trucks and a red Mazda cargo truck. This was confirmed by police investigators based on the cargo manifest of the Lite Shipping vessel which the group boarded for Nasipit. CCTV footages also revealed that all three trucks were “fully loaded” and covered by tarpaulin. The group arrived at Nasipit Port at 5:00 p.m. Sunday, according to P/Supt. Rene Kyamko, head of the Provincial Intelligence Branch (PIB) in Camp Dagohoy. Supt. Kyamko said the police in pursuit of the fleeing suspects were almost a day behind since the victims only learned that they were swindled Monday morning. Eighteen of the victims are local businessmen, one is a balikbayan, one is a car dealer based in Mandaue City, Cebu, and the other victim is the owner of the residential unit at Royal Palms that was rented by the syndicate. Analyn Antasuda, the owner of the Royal Palms house, told the Chronicle that the suspects rented her fully-furnished unit in the later part of September paying 3 months’ rental. However, when she found out that the group had left on Sunday, she found out that they have stolen some of her valuable home furnishings. Mitsubishi Mandaue sold the Adventure to Torralba on October 23, and was issued several checks to cover several installments. Since it was brand new, the Adventure does not bear a plate number, only a conduction sticker, according to Supt. Kyamko. Dionisio Borja is the owner of the reconditioned white Kia Bongo who was paid a post dated check in the amount of P315,000.00 under the account of F. Torralba Enterprises. Cherry Lyn Baliling Lomod, branch manager of Donvil Trading Display Center in Taloto, Tagbilaran City, sold a Kia Bongo to F. Torralba Enterprises worth P320,000.00 and was issued two checks, post-dated October 30 and November 9. Another victim is Johnrey Abulag, 23, a sales agent of Fortune Agrivet Supply who delivered sacks of Pigrolac feeds and Atlas fertilizer in the total amount of P174,000.00 for which he was issued a post-dated check in the name of F. Torralba General Merchandise. Rodelo Rosalina, is a salesman of LDI-DSG, who delivered cartons of various grocery items worth P75,000.00; Reyna MeraApao, delivered sacks of unmilled rice worth P50,350.00; Jelibeth Clarite of Bohol JSL Enterprises Inc. also delivered sacks of rice and flour worth P81,000.00; Ronnie Tabel, a salesman of JETS Marketing, various oil and petroleum products worth P49,320.00; Amando Relampagos Jr. of Leonardo Distributor’s Inc., Kopiko products worth P54,476.00; Rogelio Tambanillo Jr. of Hi-Jar Paint Center, paints worth P88,469.00; Jocelyn Melina Balais of JJED Phils. various products worth P86,248.00 for which she was issued to post-dated checks. Santa Mercado is a pharmacy assistant of Botika ng Bayan who delivered 100 boxes of MX3 food supplement worth P100,500.00; Alfredo Torreon of AP Blue Whale Corp. who delivered tires worth P103,298 but was issued post-dated checks instead of the agreed cash payment; Claire Danao Jaluag, sales agent of B&J Computers who delivered to F. Torralba Enterprises computers sets and various computer accessories and was paid post-dated check in the amount of P110,200.00; Epifania Dag-um, a businessman who sold 2 cellular phones worth P36,080.00. Lito Baton, P66,863.00 worth of Magnolia products; Justiniana Ellorimo, delivered eggs amounting to P199,038.00; Virginia Doroy, petroleum products worth P21,120.00, and Joramel Palma Lacaba, P55,440.00 worth of Buah Merah Mix.